The new coat of arms granted to the Borough of Mid and East Antrim consists of several component parts, the central one being the shield, upheld by two supporters; over the shield sits a helmet with a crest; beneath it is a motto. 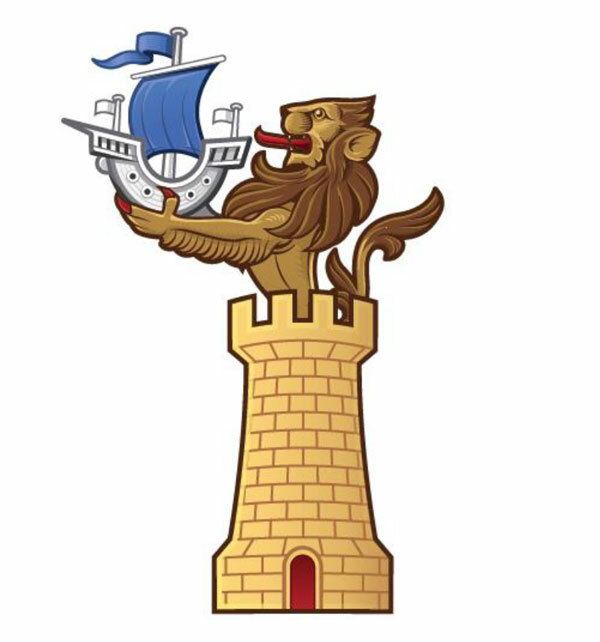 As a freestanding element, the Borough has been granted a heraldic badge. The design of all these components has been at least partially informed by the coats of arms of the Borough’s three predecessor bodies, the Boroughs of Larne, Carrickfergus and Ballymena. 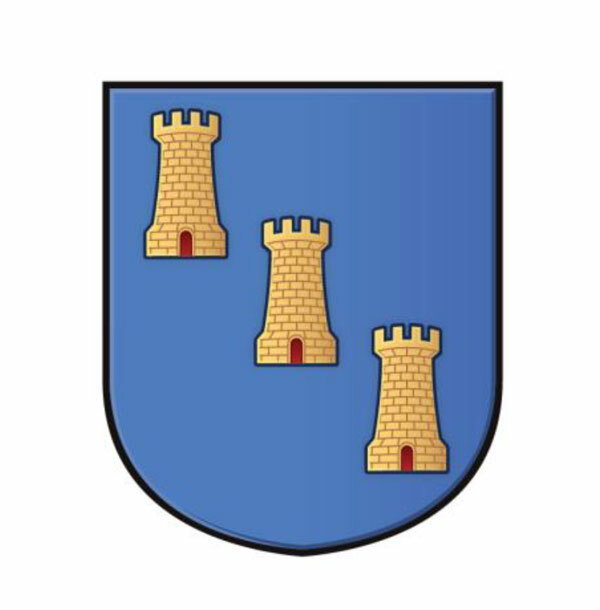 The shield is a very simple design, described in the technical jargon of heraldry as follows: Azure three Towers palewise in bend Or – in other words , three golden towers placed vertically along a diagonal line in a blue field. 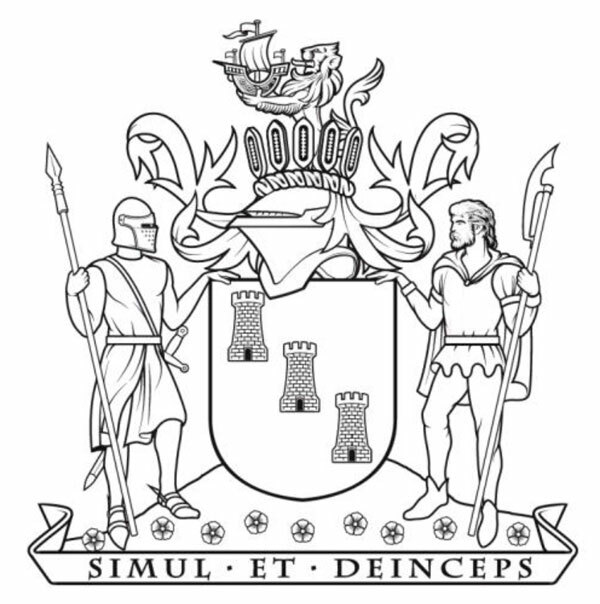 This is a simple reference to the three predecessor authorities, but it also derives from the simple shield design in the arms of Ballymena, which had seven such towers in a blue field. The crest (Within a Circlet composed of eight Shuttles (five of which are visible) palewise Or a demi Lion proper armed and langued Gules holding between the paws a Galley Argent sail set and pennon flying Azure) it is based in large part on the crest of Carrickfergus, a galley with a lion on the sail, though the shuttles come from the shield of Larne (which also had a ship – though a three-masted vessel rather than a medieval galley). The crest sits on the helmet within a ‘crest wreath’ or ring of twisted cloth. Most often crest wreaths are of two colours only, but three coloured examples are used; here, the reference is once more to the coming together of three boroughs, and to the words in Ecclesiastes 4:12 “A threefold cord is not quickly broken”. On either side of the shield stand the supporters: on the left as we look at it, a Knight vested in Chain Mail and War-Helm proper Surcoat of the colour of flax flowers proper hanging from the waist by a Lanyard a Sword in the exterior hand a Spear also proper; and on the right an Irish Kerne or Warrior of the sixteenth century proper vested in a Tunic Gules with Trews Azure and Belt and Brogues of untanned leather proper wearing a Cloak fastened at the neck of the colour of flax flowers proper and supporting with the exterior hand a Halbert. These are the supporters in the arms of the Borough of Carrickfergus, though in reversed positions. They stand in a stylized landscape with Slemish Mountain in the background and flax flowers in the foreground. Please note at a fee more formal professional advice on use and protection can be provided by College of Arms. The coat of arms is the legal property of the Borough Council, rather than the inhabitants of the borough or any organizations within the borough. Inhabitants and organizations can informally display the coat of arms or its component parts without in any way using or claiming it as their own, purely as a mark of local belonging or allegiance. 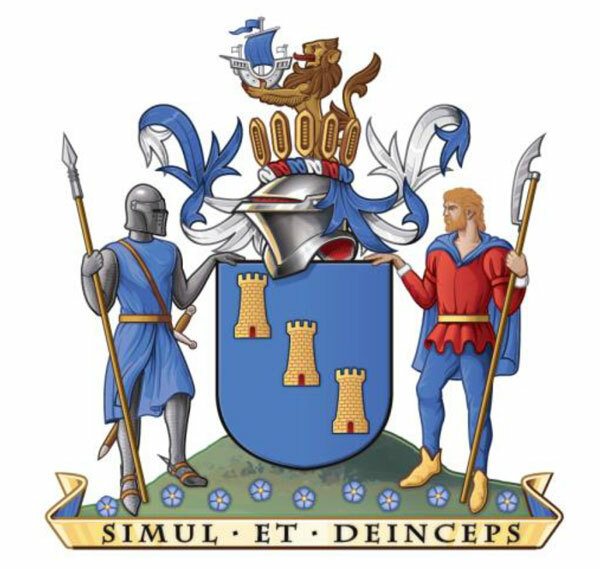 For organizations in particular, the best way to avoid any suggestion of appropriating the coat of arms is to ensure it is always displayed in conjunction with the borough name. If this is done the council need not discourage requests to display the arms. 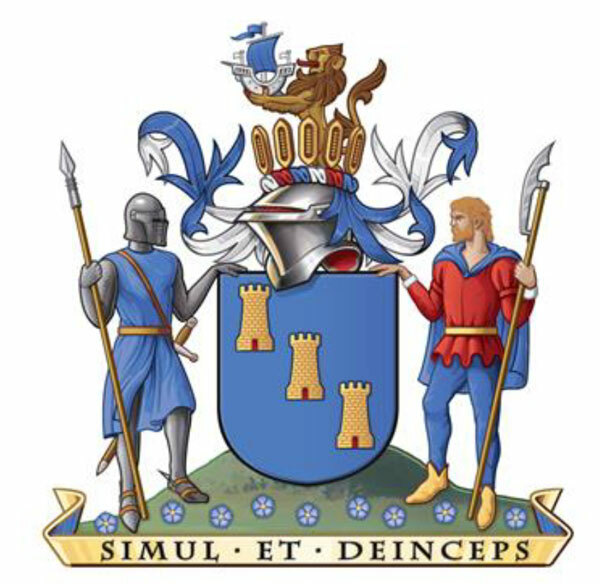 A sensible procedure for the council to adopt when processing such requests might be to consent and provide artwork that already associates the coat of arms with the name of the borough (copyright in this artwork belonging to the council); compile a register of organizations to whom this consent has been given; and indicate to the applicant that consent will be reviewed periodically. It is in short important to ensure that non-council bodies understand and remember that the coat of arms belongs to the council, even if (as often happens) they continue to display the arms for a long period and perhaps even after the council itself has ceased doing so and moved on to other forms of visual identity. It is worth pointing out that there is nothing to stop third parties creating or commissioning artwork of the council coat of arms themselves (in which they, not the council, will possess copyright) and displaying this artwork, as long as they do not use or claim it as their own coat of arms; it is far better for the council itself to provide approved artwork in which it retains rights and thereby exercise a benign and encouraging control over the activity. With regard to use of the coat of arms by the council itself, this should be encouraged, and it is entirely appropriate for anything owned or carried out by the council itself or its fully owned subsidiaries to be indicated by the coat of arms or its component parts (e.g. the shield on its own, or the shield and supporters). Partner organizations, arms-length bodies and the like should be encouraged to use the badge, though the coat of arms can (as in the case of third parties) appear in conjunction with the name of the borough. A typical example might be a private sector partner delivering some service on behalf of the council: the partner’s vehicles, especially if exclusively used for the council service in question, might show the council badge, or they might show the full coat of arms or its component parts; in the former case ideally, and in the latter case necessarily, this will be accompanied by some such wording as “Working for Mid and East Antrim Borough” or “A Partner of Mid and East Antrim Borough Council”. Again, the council can establish and retain control over this area by providing approved artwork in which it retains copyright. Finally, it is worth emphasizing again that the coat of arms is a complex entity which can be broken down. 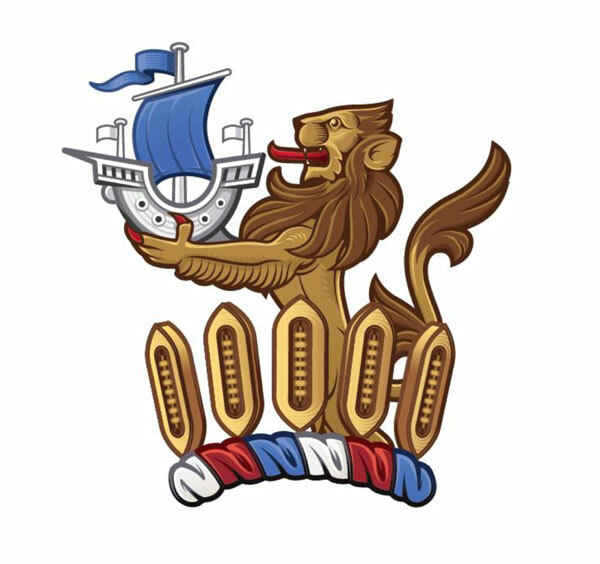 In some contexts (webpages, small-scale stationery, some signage) the full coat of arms may be too intricate to work well. The shield alone, the crest alone, or shield or crest plus motto may be far more easily “read”. Breaking down the full coat of arms in this way will also familiarize people with the component parts and establish council ownership of each one as well as of the whole. The coat of arms is thus capable of flexible use in different contexts. It may also be used in monochrome (which does not necessarily mean only black-and-white or grayscale), and may be interpreted and redrawn or repainted in any number of artistic styles. Doing so may even affirm council rights over the coat of arms, encourage awareness of its essential features, and prolong its useful life. The heraldic substance of the coat of arms, of course – what is on the shield and in the component parts – may not be altered. The College of Arms is always ready to advise whether proposed changes or reinterpretations stray across this line. Should you wish to use the coat of arms for any purpose contact the Head of Corporate Services to seek the necessary authorisation. Under no circumstances should the coat of arms be used unless approval has been granted. For further information and guidance please contact Louise Kennedy, Head of Corporate Services.